Sr Su Nghiem is a young French sister living in Lower Hamlet, Plum Village, who loves to walk barefoot, practice carpentry and traditional French folk dancing. 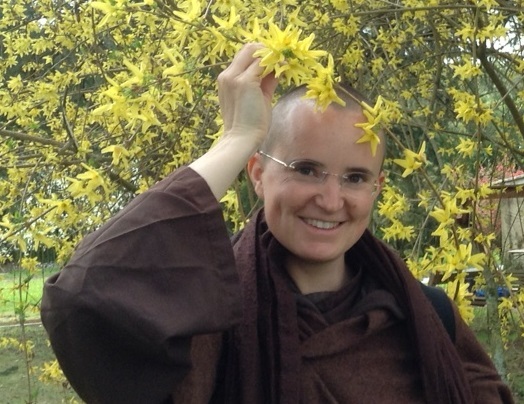 She was recently part of a monastic group who gave a teaching tour of South America. Sr Tam Muoi: Did spirituality play a part in your childhood? Sr Su Nghiem: We were not Christian or Buddhist. But spirituality was present in our rural surroundings and the way we related to nature. TM: Where did you grow up? SN: I grew up in the mountains in France, in a small village where my parents had chosen to live in the ‘80s. TM: Do you remember any spiritual experiences from when you were young? SN: My mother had lived in Japan. When she returned she built her own house in Japanese temple style. An unforgettable memory for me was when I was about 5 years old, we moved into this new house and it was empty! There was almost nothing in the house, only light passing through. There was just a small, low, dining table with cushions around it on the floor and in one corner a few books and some ceramic pots. My brother and I loved this emptiness. She gave me the love of creating a space that reflects my own interior space. TM: How did you meet Thay and Plum Village? SN: Ten years ago there was the first Young Adults’ retreat in Plum Village. I heard the echoes from this retreat and one year later I went to see for myself. I was 24 years old. TM: What was your first impression of Thay? SN: Physically so small but he made such a big impression on me. I had studied philosophy so I was struck by the accessibility, simplicity and depth of his message. TM: How did your family react to your practice and your decision to become a nun? SN: At home, I think we practiced already, without having the words for it. When I arrived in Plum Village the practice was very natural for me. But when I ordained it was difficult for my mother. She was afraid that becoming a nun meant being walled in and wearing a veil. I sent her Sr Chan Kong’s book which reassured her a lot, she felt an affinity with her energy and aspiration. Then, when my mother visited Plum Village and asked “Where are the walls?” and found that there weren’t any, her views completely changed. TM: Can you share with us an interaction that you treasure, between you and Thay? SN: At the beginning of my novitiate, I often suffered a lot with many tears. One day, Thay sent someone to find me, it was as if he had taken me by the hand and sat me down in front of him and asked “Now then, what’s the trouble?” I felt so much love and it was so unexpected. That Thay could act in such a way, even without the teaching that he then gave me, that was enough to bring me out of my ocean of tears. It was a turning point in my monastic path. He even sang me a French song! TM: How has this relation of teacher and disciple changed over the seven years since you ordained? SN: The first three years, following the experience above, my relationship with Thay was very close, like a grandfather and child, with a lot of love. I can see now that it was a way to build confidence between us, to reassure me and to help me grow roots in the Sangha. However, once I received full ordination, the relationship became more distant. But Thay invited me to find Thay in myself and to get in contact with my own wise ancestors within. All the questions that I had written to Thay he encouraged me to put before myself, keeping them alive without having to be dependant on someone outside. Now I entrust myself to Thay in me, or in a wider sense, to all my spiritual and blood ancestors. It’s as if Thay had woven a personal relationship at first and then let it go so that I could be free to follow the path of freedom. TM: What attracted you to monastic life? SN: The happy community which still thrives after 30 years. That was remarkable for me given the failed experiences of my parents in the ’80s. I was inspired by the aspiration to be free and to transform suffering. The simplicity, not needing to choose which clothes to wear each morning or to brush my hair! To lead my life deeply with beauty and at the same time helping others. TM: What surprised you about monastic life? SN: My biggest surprise was coming down from my mountain I had never used the internet, I’d never had a mobile phone, I’d only ever taken a plane once, but year after year as a monastic I find myself discovering these things as part of our practice – computer, mobile phone, my first internet address… Everything that seemed so worldly that I didn’t know before and certainly did not expect to find here. It’s the opposite of how we might imagine monastic life! I find myself in contact with thousands of people, speaking several languages, travelling all over the world with my laptop and mobile phone. It’s paradoxical, “business nun” but joyful! TM: What inspires you to continue this path? SN: The Buddha does his work inside us all, whatever happens. It’s happening right now and the process of transformation is continual and unconditional. Even in the most difficult times there is always this affirmative element. It’s like the compost in transformation, it’s very alive. As long as I can remind myself, that’s what life is, always changing physically and spiritually, that inspires me. TM: What can monastic life offer to our modern world? SN: We show how it’s possible to live very simply, which is symbolized by our monastic robe. We demonstrate to the world that we don’t need much, we can always reduce our needs to touch a happiness that is not in relation to material wealth. TM: Can you share one of the things that you have learnt about yourself and also a difficulty? SN: I’ve learnt how to be myself, to feel at peace, centred, with my mind clear even amongst a whole crowd of people without getting lost. A difficulty is the demands placed on our community, we are invited everywhere. My practice is first to recognize my own needs so that I know how to continue in an appropriate way. It is a source of difficulty because the constant demand needs to be attended to as well. It requires a lot of mindfulness and concentration not to lose myself or my energy. I am learning but it’s not easy. TM: Can you tell us something about how you practice now? SN: I practice to have confidence in my own capacity and what I’ve learnt in my 7 years of monastic life, so that I can flow with the Sangha without fear. I can find myself in new or unknown situations that terrify or surprise me, but trusting that I have enough qualities and that the ancestors are there inside me, I can just let go of fear and go along with the situation. On the path of Dharma there is no need to be perfect and with this attitude of letting go that’s already enough. TM: What are your hopes for the development of the Dharma and our Sangha in the West? SN: Dharma and Sangha are already developing amazingly in the West right now! I hope we can continue in the direction of caring for the Earth, knowing that the seed is already there, combining our practice with an ecological awareness. This is what really concerns young people right now. Our Sangha is very strong with enormous potential and a lot of beauty. Thay has given us a magnificent inheritance. If we can bring in the dimension of taking care of the Earth in even the smallest acts of our daily lives, people will be even more inspired. TM: How would you describe our practice to a complete beginner? SN: To realize that nowadays our minds go so fast, that we think too much, not only individually but collectively. If we can allow our mind to go down into our body, through mindful breathing and slowing down, we can stop overheating our brain. Just coming back to the breath, the body and our steps, we can touch great peace and clarity in our lives. Join Sister Su Nghiem on the USA Miracle of Mindfulness Tour in New York, Mississippi, and California in Fall 2015. The spirituality of religion is the emotional health of science and medicine. Wisdom is an emotionally healthy emotion and wisdom education is emotional healing education. Why accept imperfection? Accepting imperfection is the path to destruction. Accepting imperfection is the way. Go with the flow or stay with the no. What a beautiful way of putting things. Greetings sister, I look forward to meeting you soon.